July 29, 2017 – East Dorset, Vermont Jordan Coyle of Derry, Northern Ireland, raced to a win in the $30,000 Mount Equinox Grand Prix, presented by Johnson Horse Transportation, on Saturday, July 29, during the fourth week of competition at the six-week Vermont Summer Festival running through August 13 at Harold Beebe Farm in East Dorset, VT.
Six horse-rider combinations advanced to the jump-off over a track set by Canadian course designer and 1976 Olympic individual silver medalist, Michel Vaillancourt. When Jean Sheptoff of Littleton, MA, opted to withdraw Coconut Z from the jump-off, five were left to battle it out for victory. Coyle secured the win by nearly three seconds, stopping the clock in 33.85 seconds riding Escalette, owned by Elan Farm. 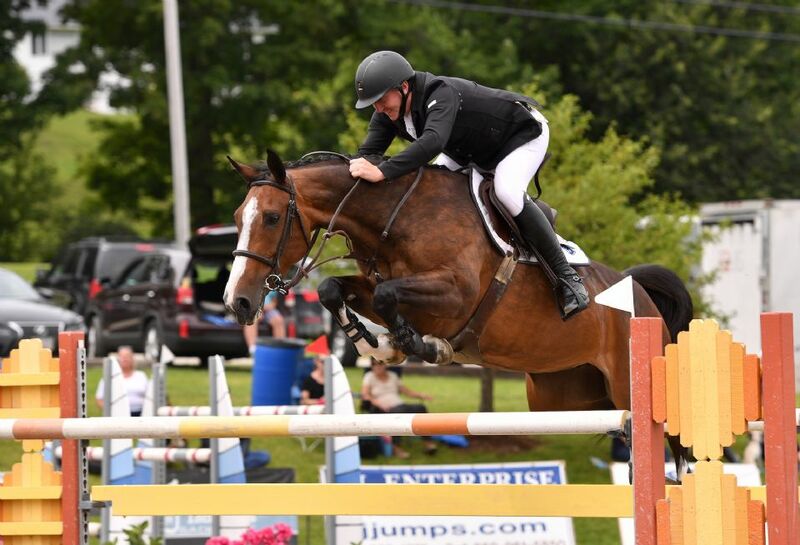 Jordan Coyle won the $30,000 Mount Equinox Grand Prix, presented by Johnson Horse Transportation, riding Escalette on Saturday, July 29, at the Vermont Summer Festival in East Dorset, VT.
Canada’s Sam Pegg of Uxbridge, ON, took second place with a time of 36.23 seconds aboard Shaia de Macheco, his partner for Thursday’s victory in the $10,000 New Balance Welcome Stake, presented by Manchester Designer Outlets. Jimmy Torano of Wellington, FL, claimed third place with a clear round in a time of 36.41 seconds riding Day Dream. Lainie Wimberly of Ridgefield, CT, was also clear in a time of 40.76 seconds for fourth place riding former three-day eventing mount, RF Quarterman, while Tracy Magness of Baltimore, MD, rounded out the top five after opting to retire Intenz van HD when two rails came down. Coyle started competing in the U.S. during the 2017 winter season when he joined the team at Old Salem Farm, based in North Salem, NY. After working with trainers, Frank Madden and Stella Manship, he got the ride on Escalette only six weeks ago. In addition to training at Old Salem Farm, Manship owns Elan Farm with her mother, Jocelyn, and recently gave Escalette a year off from competition. “She spent the past year out in a field and this is her first show back,” said Coyle, who now hopes to compete the mare in Under 25 grand prix competition this fall. “She is still pretty young and can jump a bit bigger, but before today I didn’t have any plans because I didn’t know what she was capable of. Ireland’s Jordan Coyle aboard Escalette is presented as the winner of the $30,000 Mount Equinox Grand Prix by (from right to left) Ruth Lacey of the Vermont Summer Festival, Elizabeth Rae of Johnson Horse Transportation, Jennifer Glass of the Vermont Summer Festival, and his groom, Rodolfo Morillo. For the win, Coyle was awarded a scrim by Mona’s Monograms as well as a crystal trophy from Elizabeth Rae representing class sponsor, Johnson Horse Transportation. 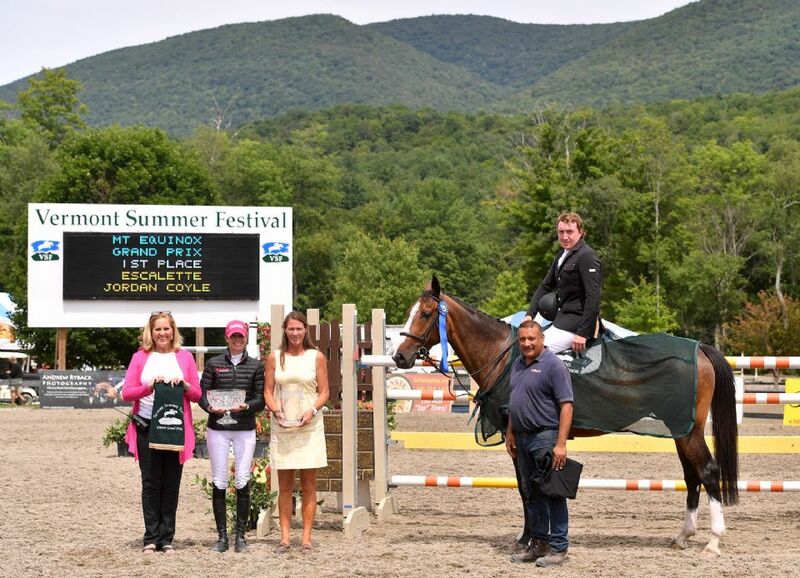 In addition, the Vermont Summer Festival presented his groom, Rodolfo Morillo, with the weekly Grand Prix Groom Award in recognition of his hard work preparing Escalette for grand prix competition. Morillo was presented with a monogrammed jacket and coolerette from sponsor Glenn Geary of Horsewatch. The fourth week of show jumping competition at the Vermont Summer Festival concludes with Classics for adult, children, and junior/amateur-owner competitors in the Grand Prix Ring on Sunday, July 30.